So apparently everyone everywhere goes crazy for Black Friday these days. Being British I guess we don’t really get it, but in the spirit of good will to all men (and women!) we thought we would celebrate in co-ordination with Cyber Monday- the busiest day for online shopping this side of Christmas. We don’t believe in heavily discounting our products, because quite frankly our pricing is awesome already for what you are getting. AND there are HEAPS of bargains in our Outlet store already. What we will do however for all our lovely existing and perhaps cautious new customers, is to give you all free shipping over the Holiday weekend. That’s right! From Friday 27th November through to Monday 30th November 2015, you can buy as many robes, teddies, pyjamas or whatever else your hearts desire and we will ship it to you for £0! 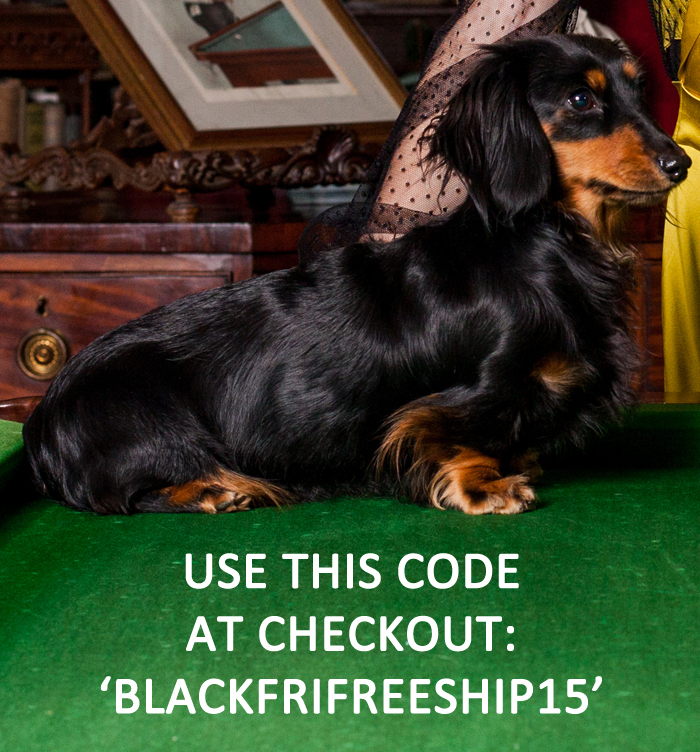 As you can see, our AW15 campaign Dachshund, Freida does black Friday………….as well as Saturday, Sunday, Monday and indeed all the week! Having of course a beautifully shiny long black fur coat. If you would like to receive FREE SHIPPING this Black Friday to Cyber Monday then make sure you use our discount code ‘BLACKFRIFREESHIP15‘ when you checkout in our online boutique. It will only work on these four days so do make sure that you stick to the above dates. If you need a little reminder then sign up to our mailing list and we will remind you over the weekend! Just sign up with the form HERE.